Is to possible to change TriggerArgs? Here you can find answered ScriptAPI topics. Hello, I am new to map making and I need some help with my script. firstly let me preface my issue by explaining what I want to happen. Suppose a player pushes the button in the image above, the button will then activate the TimerTrigger on the left side of the image. The TimerTrigger calls the script method that controls the M60 to aim at the nearest player. Consequently however the nearest player will most likely be the player that just pushed the button, and that's not good. So my BIG question is how can I tell the game not to target the player that has pushed the button? I figured that their must be some way to get the args.Sender data from the button's TriggerArgs and push it into the TimerTrigger's TriggerArgs. I don't know maybe I'm going about this the wrong way hopefully the smart people in this forum could help me out. Re: Is to possible to change TriggerArgs? You just need to exclude the player that is inside the arg.sender when it comes to find the nearest player from the helicopter, as you already said yourself, would you please share the code you currently use to control the weapon aiming to adapt the modification directly on it? currently I've set it to only look for players that are below the turret ideally I would like permanent immunity for the player that pushed the button from the turrets targeting. 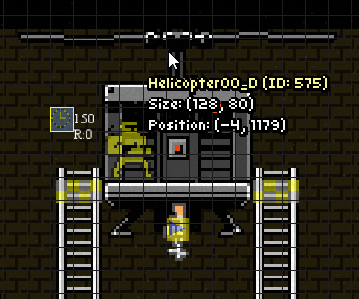 You also need to set ButtonPressed as script method of the helicopter button in order to store the player that pushed the button (only one player per time can be stored). Let me know if it is what you asked.